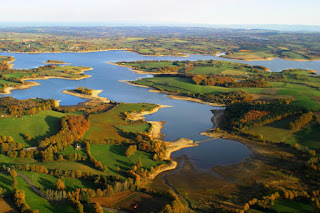 The Lac des Settons is a reservoir located in the beautiful Morvan region in central France. For more information about the history of the reservoirs in the region is the article on Lac de Pannecière (500 hectares), which is nearby. Lac des Settons is managed by the local angling club (AAPPMA) Fédération the Pêche de la Nièvre . Lac des Settons, which lies at an altitude of 600 meters, is known to be fairly easy for carp anglers. The average depth is 6 meters with a maximum water depth of 25 meters in some places. Of course, the deepest parts are located in front of the dam. Lac des Settons is known for an average carp catch weighing about 8 kilograms, with mostly mirror carp. Officially, the weight of the lake record carp is 24.5 kg, but according to different posts on forums from French carp anglers, there is also a mirror carp in excess of 30 kilograms. Night fishing is allowed on Lac des Settons between March 1 and June 30 and also on several designated spots between September 1st and October 31st. The exact locations vary from year to year, so get informed well if you want to do a multi-day carp fishing session. Please note that the use of boats and bait boats are not allowed on this water. Also beware that the transport of live carp of more than 60 cm is strictly prohibited. In France you can get fined for thousands of euro's if caught moving live carp. It is also forbidden to fish within 50 meters of the dam. Please note that you can use half of the lake from both sides as shown in the cartoon above. Below you can find some beautiful Youtube footage of carp fishing on Lac des Settons in France.